Joan Crawford modeling "Change," a two-piece silk dinner dress with gold paillettes designed by Gilbert Adrian for the film Humoresque (1946). New York and Paris, circa 1921-22. Family: Married Janet Gaynor in 1939; son: Robin. Career: Film and theater designer, New York, 1921-28; designer, MGM studios, Hollywood, 1928-39; ready-to-wear and custom clothing salon established, Beverly Hills, 1942-52; fragrances Saint and Sinner introduced, 1946; opened New York boutique, 1948; retired to Brasilia, Brazil, 1952-58; film designer, Los Angeles, 1958-59. Exhibitions: Retrospective, Los Angeles County Museum, circa 1967; retrospective, Fashion Institute of Technology, New York, 1971. Awards: Coty American Fashion Critics award, 1944. Died: 14 September 1959 in Los Angelos, California. "Do American Women Want Clothes?" in Harper's Bazaar (New York), February 1934. "Garbo as Camille," in Vogue (New York), 15 November 1936. "Clothes," in Stephen Watts, ed., Behind the Screen: How Films Are Made, London, 1938. Powdermaker, Hortense, The Dream Factory, Boston, 1950. Riley, Robert, The Fashion Makers, New York, 1968. Lee, Sarah Tomerlin, ed., American Fashion, New York, 1975. ——, American Fashion: The Life and Lines of Adrian, Mainbocher, McCardell, Norell, Trigére , New York, 1975. Lambert, Eleanor, The World of Fashion: People, Places, Resources, New York and London, 1976. Pritchard, Susan, Film Costume: An Annotated Bibliography, Metuchen, New Jersey and London, 1981. Maeder, Edward, et al., Hollywood and History: Costume Design in Film, New York, 1987. Leese, Elizabeth, Costume Design in the Movies, New York, 1991. Gutner, Howard, Gowns by Adrian: The MGM Years, 1928-1941 ,New York, 2001. Gordon, James, "One Man Who Suits Women," in American Magazine (Philadelphia), March 1946. Obituary, the New York Times, 14 September 1959. Sims, Joseph, "Adrian-American Artist and Designer," in Costume, 1974. Kinsey, Sally Buchanan, "Gilbert Adrian: Creating the Hollywood Dream Style," in Fiberarts (Asheville, North Carolina), May/June 1987. Lambert, Gavin, "Janet Gaynor and Adrian," in Architectural Digest (Los Angeles), April 1992. By the time MGM costumer Gilbert Adrian went into business for himself in the middle of World War II, his potential customers were already familiar with his work. For over a decade American women had been wearing copies of the clothes he had designed for some of the most famous movie stars of all time. Adrian's ability to develop a screen character through the progression of costumes, be they period or modern, was translated into dressing the newly modern career women while men were away at war. Adrian was primarily an artist, having trained in France, and was able to perceive Greta Garbo's true personality—aloof, mysterious, earthy—and change the way the studios dressed her; insisting upon genuine silks, laces, and jewels to lend authenticity to her performances. For all the stars he dressed, Adrian believed the quality of materials worn by a woman affected how she behaved in the clothes, even if the details were not immediately obvious. He brought the same philosophy to his custom and ready-to-wear creations. Of course the copies MGM permitted to be made of Adrian's costumes, timed to coincide with the releases of the films, were not always of the same fine quality as the originals, but the overall look was what women were after. While films provided a great escape from the dreariness of the American Depression, the famous white organdy dress with wide ruffled sleeves that Adrian designed for Joan Crawford in the movie Letty Lynton offered cheer and flattery. Macy's New York department store alone sold nearly half a million copies in 1932. The artist's eye perceived the need to balance Crawford's wide hips, and the broad shouldered typical "Adrian silhouette" triggered a fashion revolution in America and abroad. For Jean Harlow in Dinner at Eight, Adrian created another widely copied sheer white bias-cut satin ballgown. Though Madeleine Vionnet invented the bias cut and Elsa Schiaparelli was credited with padded shoulders, at least in Europe, Adrian had the awareness to bring high fashion and glamour to the screen. 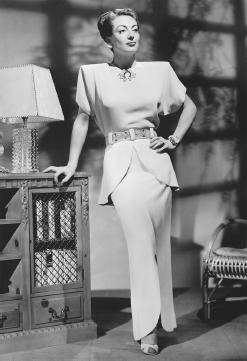 Joan Crawford praised Adrian's emphasis on simplicity to make a dramatic point, as in the suits she wore in her later films. Even in lavishly costumed period dramas, Adrian was able to stop short of excess. Often, as in Garbo's Mata Hari, the character's evolution into purity of spirit would be expressed through increased simplicity of costume. 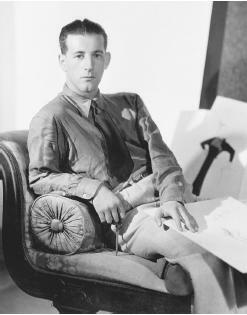 Adrian's understanding of light and shadow made possible clothing that, due to clarity of line, looked as well in monochrome film as later black-and-white photographs of his commercial designs would show. His eye for perfect cut was impeccable. A day suit consisting of a beige wool jacket trimmed with loops of black braid, paired with a slim black skirt, black gloves, and beige cartwheel hat, looks as crisp and smart today as it did when featured in Vogue in 1946. Fluid floor-length crêpe gowns were dramatically yet whimsically decorated with asymmetrical motifs of horses, cherubs, or piano keys, or his taste for modern art would be indulged in gowns made up of abstract jigsaw puzzle shapes in several colors. Just as in films Adrian worked within themes, so did his collections for Adrian, Ltd. develop according to such themes as gothic, Grecian, Persian, Spanish, or Americana. For the latter he appliquéd Pennsylvania Dutch designs on gowns and made tailored suits and bustled evening gowns out of checked gingham, echoing the gingham checks worn by Judy Garland in The Wizard of Oz. Adrian costumed Garbo as the essence of romance in Camille, not only in 19th-century crinolines, but in white nightgown (which could have been any female viewer's late day dinner dress) for the film's death scene. For his average American customer, Adrian recommended clothes like the "costumes worn by the heroines of light comedies…in moderatesized towns." Katharine Hepburn in The Philadelphia Story was dressed by Adrian as the ideal girl next door, while conservative Norma Shearer mirrored the sophisticated simplicity of Adrian's future well-heeled Beverly Hills clients in The Women. The spare, padded-shouldered, narrow waisted and skirted silhouette of the 1940s was the ideal medium for Adrian's artistry with fabric, while conforming to the wartime L-85 restrictions on materials—the U.S. government limitation on the amount of fabric used in a civilian garment for public consumption. The color inserts, appliqués, mitering of striped fabrics and combinations of materials in one ensemble allowed for savings in rationed fabrics, while creating the trademark Adrian look which was desired then and is still sought after by vintage clothing collectors. Old-time movie glamor would resurface in some of Adrian's elegant columns of crêpe, diagonally embellished by headed bands of ancient motifs, or thick gilt embroidery on dark backgrounds. Diagonal lines and asymmetry also lent interest, as in a short-sleeved wartime suit sewn of half plaid and half wool—completed by a hat trimmed in plaid edging. Having grown up observing his father's millinery trade, Adrian had included hats in his movie costuming and his designs, such as Garbo's slouch, cloche, and Eugenie, were widely copied in the 1930s. Adrian unsuccessfully resisted Dior's round-shouldered New Look. Men returned from the war, and women returned to the home. Decades later, with the resurgence of women into the workforce, Adrian's broad shouldered looks enabled women to compete confidently with men, as designers resurrected the masterpieces of this truly American fashion virtuoso.